The focus is often on cars when it comes to autonomously driving vehicles. Thanks to Daimler AG, variety comes to the table. 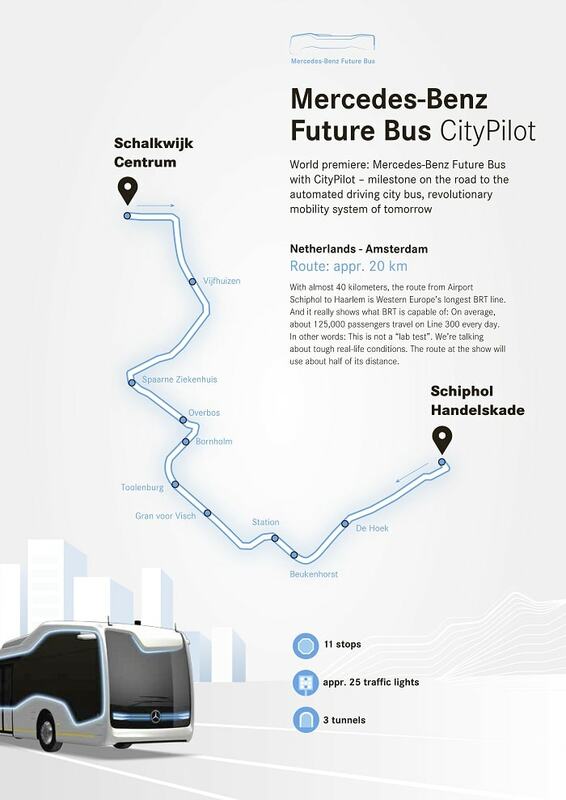 In the Netherlands, Daimler Benz recently demonstrated its autonomously driving bus. During the officially first test drive on a route of about 20 kilometers, it was not needed to use the brake pedal or accelerator. 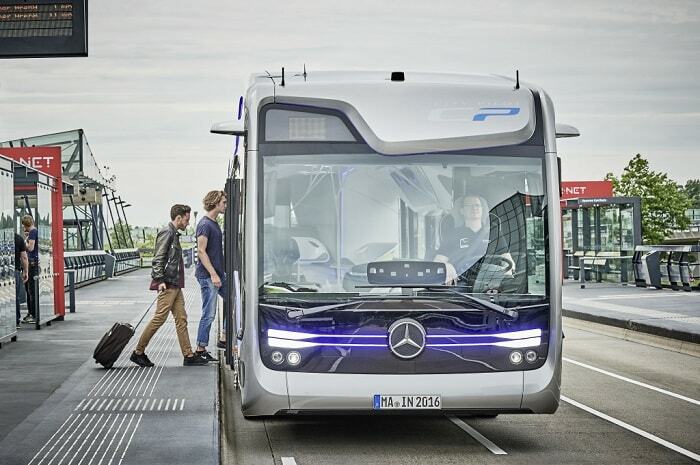 According to Daimler, the autonomous bus stops by achieving centimeter accuracy at traffic lights. Also at the bus stop, the bus arrives in automated mode, opens and closes the doors, and drives away again. The brakes are activated automatically in a gentle way thus the autonomous bus comes to a standstill safely in case of red lights. Even if the traffic lights turn green, the bus remains standing in case of still crossing pedestrians. After moving off automatically, the bus is able to master challenges like passing through tunnels, braking for obstacles or pedestrians and communicating with traffic signals. CityPilot activates the automatic braking system that decelerates the vehicles as required in order to avoid a collision. Allegedly, Daimler Buses is the world’s first manufacturer to put a city bus into automated operation in a real-life traffic situation. After moving off automatically, the bus is able to master challenges like passing through tunnels, braking for obstacles or pedestrians and communicating with traffic signals. CityPilot activates the automatic braking system that decelerates the vehicles as required in order to avoid a collision. Allegedly, Daimler Buses is the world’s first manufacturer to put a city bus into automated operation in a real-life traffic situation. The only thing the driver has to do is keeping an eye on the system. A large display provides all important information for the driver in an innovative presentation style, and can concentrate fully on his or her core tasks. He or she does not need to deal with tickets, at all times. The electronic ticket system is doing this job. It is an important element of the bus’s connectivity and dispenses with the conventional selling and checking of tickets by the driver. The system provides information if the road is suitable for automated driving. Then, the driver can decide to switch on the CityPilot with a trigger button. The autonomous drive stops immediately if the driver overrules CityPilot by moving the accelerator, brake pedal or steer. Daimler can fall back on experiences with the Future Truck. 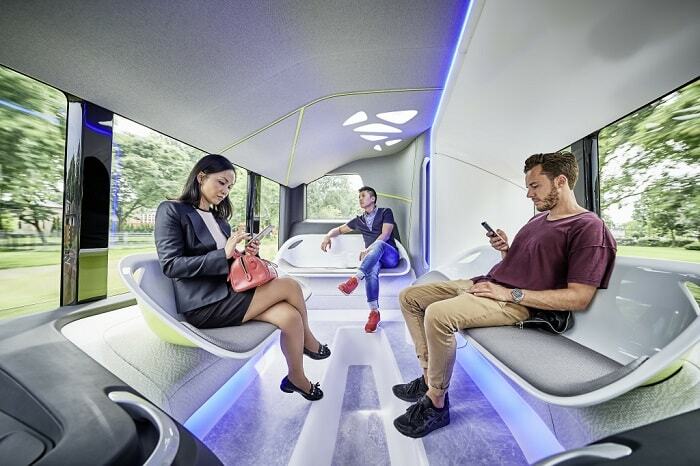 This self-driving truck was presented on 3 July 2014 in Magdeburg, Germany. It was not needed to reinvent a long-range radar with a range of up to 200 m, electrically actuated Servotwin steering and the mirror cams which are used instead of exterior mirrors. Further cameras, Wi-Fi and the satellite-controlled GPS navigation system are additional essential tools. Two short-range radar sensors in the front section and two at the front corners cover distances from 50 centimeters to ten meters ahead of the bus. 3D vision and recognition of obstacles and pedestrians are realized with two stereo cameras with a range of up to 50 meters. Wi-Fi enables communication with the route infrastructure like traffic lights or railway crossings. Probably the bus can more often take advantage of “green waves” of traffic lights compared to common buses. 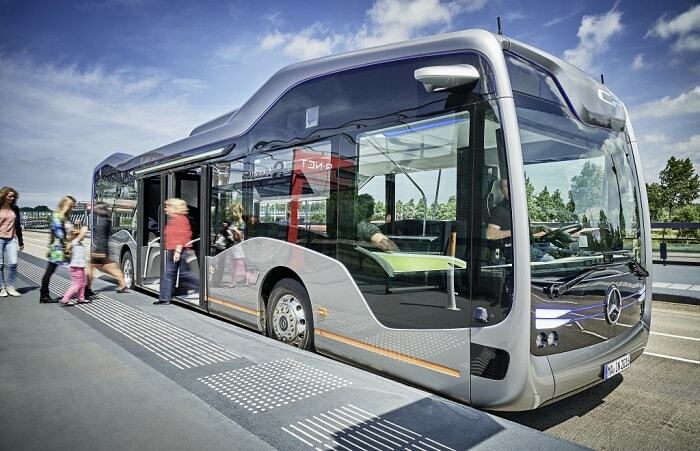 The intelligent connectivity of the cameras and sensors allows a precise picture of the surrounding area and the exact position of the autonomous bus. The Mercedes-Benz CityPilot is not science fiction, it can already become a reality tomorrow. Even today, the bus is in public operation following an exemption from the state transport authority in Stuttgart according to Section 70 of the German vehicle licensing regulations, based on an expert report by TÜV Rhineland. It is allowed to operate on public roads despite deviating from the normal technical and service specifications. “…we are investing approximately €200 million in the further development of our city-bus portfolio. The advantages of CityPilot for our customers are clear: Our Future Bus operates fuel efficiently and with minimal stress on the engine. 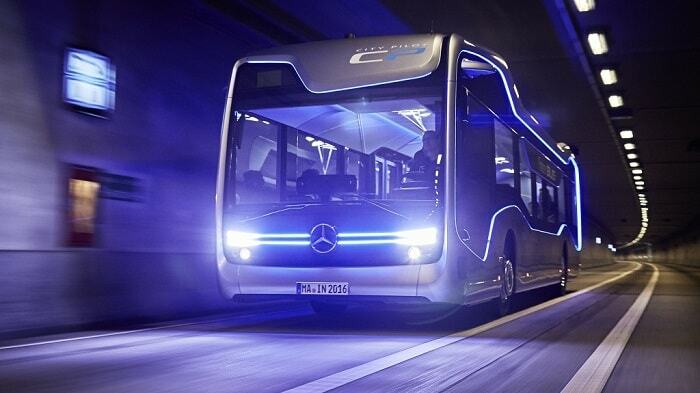 That has a positive impact on operating and maintenance costs, vehicle lifetime and availability.” Hartmut Schick, Head of Daimler Buses, states. The low-floor bus is partitioned into three sections. The so-called service section is located in the front close to the driver. The middle part, express section, provides standing room for short journeys and quick passenger flow. The rearward lounge section is intended for passengers spending more time. Their smartphones can be charged wirelessly, inductively that is. The advantages of BRT systems are that they are quick to establish for urban and traffic planners, as well as being inexpensive and flexible. Due to the fluent and safe traffic routing with less or ideally no traffic lights, a high average journey speed and thus an improved quality of life is achievable. BRT’s diminish traffic volume, exhaust gas pollution, traffic volume and traffic noise. According to experts, there are now about 180 BRT systems worldwide with a total fleet of approximately 40 000 buses. They carry around 30 million passengers every day. Above all, South America is regarded as a BRT region; its rapidly growing metropolises are making good use of BRT systems.